What are earthquakes and how far away from the epicentre can damage occur? Do earthquakes occur in Australia? What are earthquakes and how far from the epicentre can damage occur? Earthquakes are the sudden fault movements that occur when the stress along a fault has built up sufficiently to overcome the frictional resistance which opposes slip. Strong and potentially destructive ground shaking induced by large earthquakes may occur up to tens or even hundreds of km from an earthquake epicentre (i.e. where the earthquake nucleates) depending on the size of the earthquake and geology within the region. Fault movements through earthquakes redistribute stress in the crust around the epicentre and consequently affect the future earthquake activity in the region. The Earth is a dynamic planet consisting of an outer crust riding on so called lithospheric plates that are roughly 100 km in thickness. Australia lies within one of these plates. The lithospheric plates move relative to one another at rates that are typically around several cm per year. In some places, oceanic plates are gradually plunging into the Earth's mantle such as under Japan and Chile whereas at mid-ocean ridges, new crust forms as the plates move apart. It is the movement of the lithospheric plates that induces stresses in the crust and causes mountains and faults to be created both at plate margins and within plates. The Australian plate has been subjected to enough stress for mountain ranges to have formed and the present stresses are sufficient for earthquakes to occur. Australia is seismically active and earthquakes pose a substantial risk as demonstrated by the deadly magnitude 5.6 Newcastle earthquake of 1989 (click here for a list of some Australian earthquakes). When compared to plate margin regions such as California or Japan, the rate of earthquakes is lower, but relative to other intraplate regions, Australia's earthquake activity is moderate to high. The level of the earthquake hazard of Australia's more active regions is roughly comparable to that of well known seismic zones in central USA. This is around 5 to 10 times lower than in California measured in engineering terms (horizontal ground acceleration with 10% probability of exceedance in 50 years). The largest earthquake that can occur in Australia is not yet known but is expected to be above Richter Magnitude 7, roughly similar to large Californian earthquakes. For example, the 1988 Tennant Creek earthquake had a Richter magnitude around 6.9, slightly larger than the 1994 Northridge earthquake near Los Angeles (Mw=6.7) that resulted in $US 15 billion and cost 57 lives. Earthquakes offshore southeastern Australia have exceeded ML=7 and different magnitudes calculations for the onshore Meeberrie WA earthquake in 1941 ranged from 6.9 to 7.2. 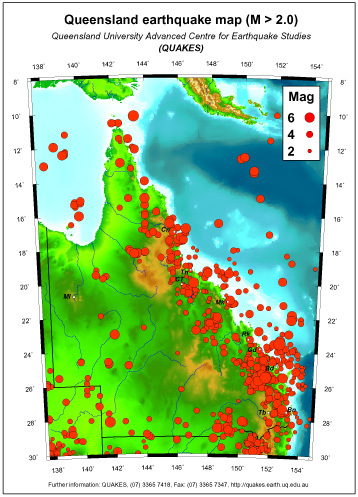 The map shows above magnitude 2 earthquakes in Queensland for the period 1866 - June 2000. Most earthquakes shown on the map were recorded since 1977 when seismographs started to be installed around the State's large dams. From 1977 until 2000, the Queensland seismic network detected and located over 110 earthquakes per year on average. 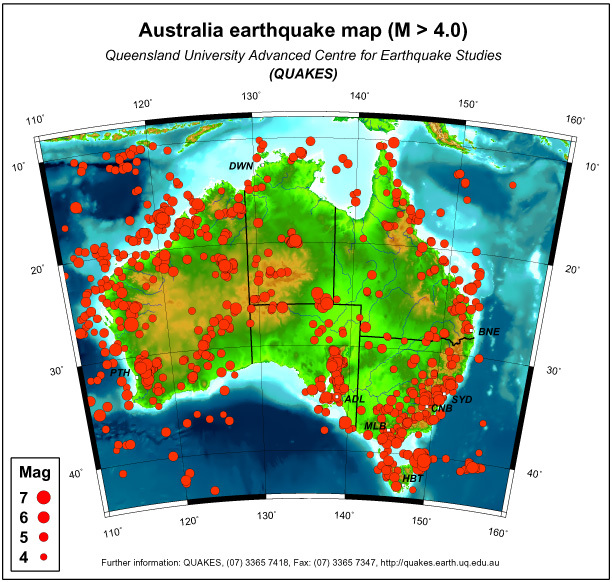 A small fraction of these events were also located by the national seismic network of the Australian Geological Survey Organisation which involved around 3 instruments in Queensland compared to around 30 within the Queensland network managed by UQ. The earthquake maps give a rough indication of the level of the earthquake hazard within the region. However, comparison between different sub-areas based on the density of epicentres is not possible without analysis to account for the sparseness and variable density of the seismic network. Furthermore, the presence or absence of small or large earthquakes is not necessarily indicative of the future potential of a large earthquake due to the combined effect of network limitations and complexity of the earthquake process. Forecasting of earthquake potential requires high-level analysis and research. Recent work conducted in collaboration with leading international research centres (primarily China, Japan and USA) suggests that intermediate term forecasting is achievable with a suitable network through advanced analysis and computer simulation. Collaborative research with China presented at international conferences during 2000 indicates that both the Newcastle 1989 earthquake and the Burra SA 1997 earthquake were apparently forecastable (Queensland data was not sufficient for similar forecasting research using data within the state). The Queensland earthquake map shows that the State is seismically active and suggests the highest hazard region lies along the populated eastern coast and near offshore regions. The largest earthquakes on the map are the offshore Gladstone 1918 earthquake (Richter magnitude estimate of ML=6.3 based on felt area and ML=6.0 based on an instrumental recording), and the 1935 Gayndah earthquake (Richter magnitude ML=6.1). Earthquakes with the potential to cause serious damage or fatalities (ML > 5) have occurred on average about every 5 years during the last century with several near misses to the State's large population centres. The map shows earthquakes with Richter magnitudes greater than 3.5 and suggests the higher seismicity and hazard regions are along eastern Australia (in bands running from Melbourne to Newcastle, Brisbane to Gladstone, and Mackay to Cairns), in the Adelaide geosyncline, and in parts of Western Australia. Less seismographs and lower population density during the last century in Queensland relative to eastern NSW and Victoria means that the true seismicity in Queensland compared to eastern NSW and Victoria may be higher than it appears on the map. Caution should be used when interpreting this map in terms of the earthquake hazard because of sparseness and heterogeneity of seismic monitoring, varying times that instruments covering different parts of the country were installed, and because of the complexity of the earthquake process. For example, the occurance of few earthquakes in any given region may be due to the inability of the seismic network to detect earthquakes, low seismicity and hazard, or a period when little stress is being relieved through small earthquakes and a large event is about to occur. The possibility for earthquakes to strike what appeared to be a quiet area was demonstrated by the magnitude 6.9 Tennant Creek earthquake in 1988. Prior to this event, the Tennant Creek area exhibited no seismic activity whatsoever despite being well monitored. Earthquakes this century (1900-1994) with magnitude greater than 5.0 according to an international catalog combined with the Australian catalog. When compared to plate margin regions such as California or Japan, the rate of earthquakes is lower, but relative to other intraplate regions, Australia's earthquake activity is moderate to high. The level of the earthquake hazard of Australia's more active regions is roughly comparable to that of well known seismic zones in central USA. This is around 5 to 10 times lower than in California measured in engineering terms (horizontal ground acceleration with 10% probability of exceedance in 50 years). The largest earthquake that can occur in Australia is not yet known but is expected to be above Richter Magnitude 7, roughly similar to large Californian earthquakes. For example, the 1988 Tennant Creek earthquake had a Richter magnitude around 6.9, slightly larger than the 1994 Northridge earthquake near Los Angeles (Mw=6.7) that resulted in $US 15 billion and cost 57 lives. Earthquakes offshore south-eastern Australia have exceeded Richter magnitude ML=7. Click here for a list of some noteworthy Australian earthquakes. Click here for a list of some large earthquakes in the world.